This is the first half of a guide to gateway games, including a list of the ones that have worked best for me. Before I get into the games themselves, I should probably give ‘gateway game’ some kind of definition, as well as giving the post a bit of context. A good gateway game does what it says on the tin: it serves as a gateway back into the hobby of board and/or card gaming for those scarred by the likes of Monopoly and terrible TV tie-ins given as lazy Christmas presents (and made by even lazier games companies). These gateway games tend to have similar traits, while each being a very individual game: simple to teach, not too long (from 20 to 90 minutes), not too involving, mostly open and with quick turns. By ‘not too involving’ and ‘mostly open’ I mean they don’t tend to leave you having to think a great deal between turns (so everyone can still be sociable) and most of what you do and have is open for all to see (both so others can help, and to avoid things getting too cagey and intense). Gateway games were really relevant to me in 2011, and I hope will continue to be in 2012. They’ve seen Zoe and me spread the board gaming love to both friends and family in a way that has been really rewarding socially – and long may that continue. With tighter purse strings, bigger families and less energy for big nights out, big nights in are definitely a winner. So here are five games that have really help get people into playing games with us in the past few years, along with a short overview of each (plus sometimes a few other similar options) and why I think they’ve been so successful. This game might not appeal to all groups, which is why I have it at number five, but when this one works it really works. The Downfall of Pompeii is a great little board game that is split into two parts: first you populate Pompeii, before trying to get all your citizens out as the volcano erupts. The person to get the most of their citizens out wins. I’ve reviewed Downfall of Pompeii (link above), so I won’t go into depth again. Instead, I’ll briefly list its gateway credentials. The game’s distinct sections can be taught as they happen, while one play lasts about 45 minutes. The first half of the game is play a card, take a card; the second half draw a tile, lay a tile, move citizens. You can’t plan, as what others do will heavily affect your turn, so you’re free to watch the chaos unfold. So, why is it only for certain groups? Basically, it has a strong ‘take that’ element which doesn’t suit everyone. You’ll be trying to get other people’s citizens thrown into the volcano, so it can get a tiny bit bitchy! It’s all in good fun though, so the majority of people should enjoy it. It’s not a game you’ll find on the high street and is currently out of print, but it is one you can find if you dig around a bit (I can probably give you a hand if you want to find one). However, equally good in the same way is a reprint of an old game called Survive: Escape From Atlantis, which you may be able to find easier. It also plays fast and fun, with the emphasis on ‘take that’ mechanics as you try and drown your opponents as you all flee the sinking city (good clean fun). This is another game that meets all the gateway game criteria I mentioned above, but since I haven’t reviewed it yet I’ll give a brief overview of the way it plays here. Alhambra sees each player building their own palace out of building tiles they’ll buy with money cards from their hand. Players take it in turns to take money cards from those face-up on the table, buy palace tiles from a central store or rearrange their palace. Both the palace tiles and money cards are in a variety of different colours. There will always be a choice of four tiles to buy; these are on coloured spots in the central store, so you’ll need to have enough money of that colour to buy the tile (paying the exact amount for a tile gives you an extra go). Tiles can be arranged as you like following simple rules, with tiles having walls that need to match up as you expand. There are three scoring rounds throughout the game, where the person with the most of a certain coloured tile will get points. In the latter scoring rounds, the person who has the second most (and then also third most in the final round) will also score some points. There are also points awarded for the longest joined-up wall you have in your Alhambra, adding an extra dimension to play. The game flows quickly, with their being plenty of luck in what is available when it comes to your turn. Everyone’s Alhambra is open, so people can suggest different placements of tiles, while there is little to do between your turns as you have no idea what will happen to what’s available. This makes it zip along in a friendly, chatty manner and games run under an hour. The only real downside is some slightly annoying colour clashes that can confuse players and be a real frustration for some. It can be easy to think you have the right cards to buy a tile, only to realise you’ve been matching your cards to the tile you want, not the colour of the space it is to be bought from; a silly oversight, but not a big enough issue to keep Alhambra from my list. We introduced this to a couple of other gaming couples and one has already purchased it. Of all the people we play with, no one ever refuses a game either. However, I think that by this time next year Alhambra’s place in my top five gateway games may have been usurped by Pergamon. Released in 2011, this board game also has a few more mechanisms in play than your average gateway game but again everything is on the table for all to see and help each other along. Turns are fast and play time is well under an hour, with plenty of luck thrown in. 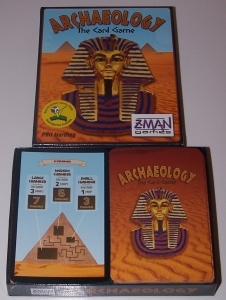 Archaeology: The Card Game (from now just Archaeology) perhaps isn’t a gateway game as such; alongside the likes of Hey! That’s My Fish, Pickomino and For Sale it’s more a game that shows you can spend less than £10 on a small box game and get something really worth owning. This game takes the simple principal of rummy (ie, set collection) and gives it a theme, some great ‘screw you’ mechanics (where you steal another player’s card, for example), loads of tension and a few other little tweaks to make it a whole new and more interesting beast. See my review of Archaeology (linked above). Since getting this as a Christmas (2010) gift, two other couples we know that have been getting into the gaming hobby have also picked up copies of Archaeology. I think the lightness and non nerdy theme really help, as does the forced interaction and strong luck (and push your luck) elements. But even with all that, if you play well you still feel you get rewarded for doing so; a new player is unlikely to win their first game, but could certainly win their second. Whether it’s a little trick taking card game such as Archaeology, a dice game such as Pickomino, a bidding card game such as For Sale or a tile laying game such as Hey! That’s My Fish, these cheap small box games have two other great traits: portability and ease of play. This type of game is often called a ‘filler’, as they’re ideal for either the start or end of a game night – or for generally filling time when you’d otherwise be waiting. But they can also go to a party, on holiday, or over to a friend’s for the weekend. And best of all they can be taught while they’re being played, don’t overstay their welcome (maybe 20 minutes on average per game) and stand up to multiple repeat plays in a session, as well as over the years. This entry was posted in Board games by Chris Marling. Bookmark the permalink.